Business Mirror, 5 Oct. 2017 - Climate justice activists, composed of civil society groups and people's organizations, held a concerted action at the Bank of the Philippine Islands (BPI) Ayala Triangle to protest the bank's planned financing of a new coal-fired power plant in Atimonan, Quezon. Protesters demand that governments and energy producers respect the fundamental right to breathe clean air. Moreover, “coal-fired power plants speed up global warming,” the protesters said. 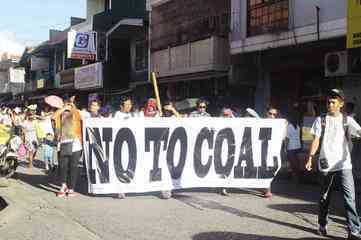 In June 2015, protesters led by Church leaders, marched in protest of a planned coal power plant in Atimonan town, the third coal power plant that the province of Quezon would host . More than 1,500 protesters dramatized opposition to the proposed 1,200-megawatt (MW) coal-fired power plant in the town that faces the Pacific Ocean, some 173 km south of Manila. “As we celebrate the World Environment Day (June 5), we also declare our strong opposition to another coal-fired power plant in Quezon province,” said Efrelyn Escultura-Calabano, assistant program officer of Tanggol Kalikasan-Southern Luzon.. Dubbed as “Lakad-Dasal-Bibliya para sa Kalikasan,” the procession first went around town before stopping in front of the municipal hall for a short program. The marchers proceeded to the town’s Our Lady of the Angels Parish Church grounds for an overnight vigil. The program at the church compound was filled with speeches against coal-fired power plants, protest songs and dances. In a statement, the protesters urged the public “to stand up and demand that governments and energy producers respect the (people’s) fundamental right to breathe clean air and not see it as a threat to their profits.” “Coal-fired power plants speed up global warming,” the protesters said. Originally, plant proponent Meralco PowerGen planned to put up a liquefied natural gas (LNG) combined cycle power plant on a 80-hectare land in Barangay Villa Ibaba. However, Meralco converted the project to a coal plant in the absence of a government policy supporting the LNG industry. The local government has already approved the project that would generate 1,000 to 2,000 jobs for local construction workers aside from a tax windfall expected from the plant’s operations. Quezon province is already host to two coal-fired power plants. The existing 735-MW plant in Pagbilao town facing Tayabas Bay is now being extended with an additional 420-MW plant. Mauban town, also along the shores of the Pacific Ocean, is host to a 1,500-MW plant..
On October 5, 2017 , CLIMATE justice activists held a rally at the Bank of the Philippine Islands (BPI) office in Ayala Triangle, Makati protesting against the bank’s financing of a new coal-fired power plant in Atimonan, Quezon and other coal projects. The protest action is part of Piglas Pilipinas, a nationwide campaign for the Philippines to break free from fossil fuels. 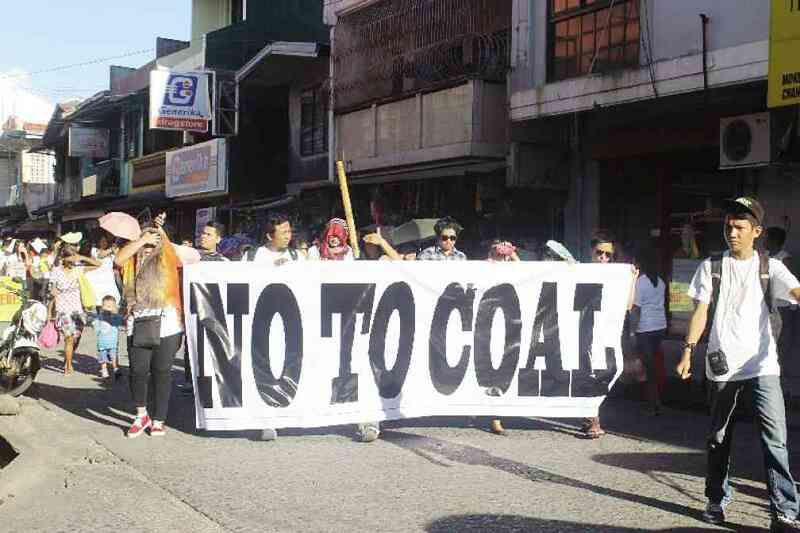 “Coal is not the answer to our country’s energy needs,” said Philippine Movement for Climate Justice Coordinator Ian Rivera. “Contrary to the coal industry’s persisting propaganda, coal is neither cheap nor clean. In fact, it has time and again been proven to be dirty, costly, and deadly.” Rivera said coal is the culprit for the health problems suffered by communities that host coal-fired power plants. The protest at the Makati central business district is part of the Reclaim Power Global Wave of Actions for a just energy transformation . “The science of climate change is unequivocal, it’s undeniable, and so now, action to transform our energy system is urgent and must be done immediately,” said Asian Peoples’ Movement of Debt and Development (APMDD) Coordinator Lidy Nacpil. “According to the latest numbers from the UN, over 80% of all remaining fossil fuels like coal, oil and gas will have to remain unburned if the world is to avoid extremely dangerous climate change,” Nacpil said. “Reclaim Power is about demonstrating that while the current energy system fails on so many levels, including its failure to resolve the energy poverty of 1.2 billion people in the world who continue to have no access to any electricity, we have solutions using renewable energy technology that can decentralize power production and actually get it to all people in a democratic, people-controlled way,” she said. “We need to ensure community and public control of our energysystems, to ensure that people’s access is prioritized over profit,” said 350.org Digital Communications Campaigner and Coordinator Chuck Baclagon. Project Details The Atimonan power station, 1200MW, was originally proposed as a power plant fueled by liquified natural gas, but the project proponent, Meralco PowerGen, later changed the fuel to coal. In February 2015 the project was approved by the Quezon provincial legislative council, or Sangguniang Panlalawigan (SP). Final approval of the project rests with the national government. The project received an environmental compliance certificate from the Environment Department on Oct. 13, 2015. In November 2015, it was reported that Meralco was still searching for partners for the project, which was estimated at US$2 billion , "with the partner likely Japanese or Korean and probably not Chinese," according to company chairman Manuel Pangilinan. In February 2016, Pangilinan expressed uncertainty about what sort of energy mix was favored by the Philippine government: "Should we turn to coal plants... should we turn to gas plants? What are the limits:” The certificate of land use conversion for the project was received in March 2016. Construction of the resettlement site is ongoing. The debt portion of the project (i.e., the capital needing to be raised) was $2 billion; the equity portion was $700 million, for a total of $2.7 billion. Permits were in hand, and resettlement of 50 of the 70 families living on the site had been finished. .
Opposition. In June 2015, more than 1,500 protesters, led by church leaders, staged a march and a prayer vigil in opposition to the project. The protest, which was named "Lakad-Dasal-Bibliya para sa Kalikasan (roughly translated: "Bible prayer walk for nature") began with a march in which participants circled the town, then stopped in front of the municipal hall before continuing to Our Lady of the Angels Parish Church. Why? Explain briefly. It seems the project is going ahead by 2017, with financing still pending. Atimonan power station. The Center for Media and Democracy. Sourcewatch. Report in favour of the project. 3 March 2017. Youth camp against the project. May 2017. For the past two years I’ve witnessed the growth of the anti-coal movement in Atimonan, Quezon, led by the Catholic Church through the work of the Our Lady of the Angels Parish. From leading mass mobilizations like the Lakad-Dasal para sa Kalikasan (prayer march for the environment) in protest of the proposed coal plant, to educating the people about the true cost of coal; from organizing people to to be involved in the protection of the very environment they are living in, to solarizing their Church, the anti-coal movement in Atimonan is at the forefront of climate action. 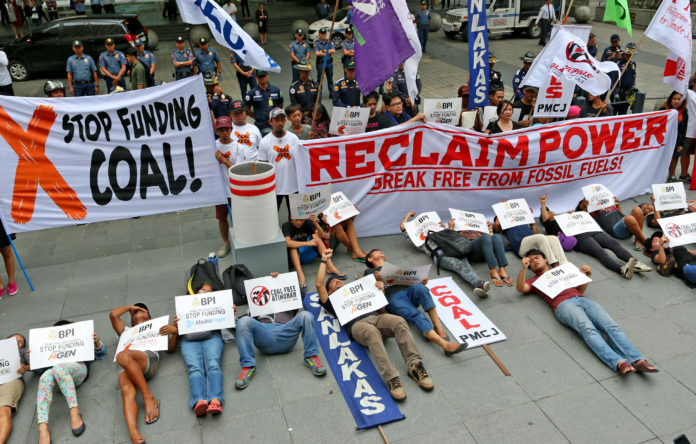 Business Mirror, 5 Oct. 2017 Climate justice activists, composed of civil society groups and people's organizations, held a concerted action at the Bank of the Philippine Islands (BPI) Ayala Triangle to protest the bank's planned financing of a new coal-fired power plant in Atimonan, Quezon.